Muna Jawhary, author and coach, discusses the costs of sexism for both genders in new book. Despite their best efforts, women still face obstacles pursuing a career and being a mother. Unconscious to the many limitations placed on their choices, women still believe that they face a stark choice of either their careers or a happy home. With much research and learning from her own journey, Muna Jawhary wrote “Women and False Choice: The Truth about Sexism” to dispel the many myths we still have about women and men in society. After growing up in Jordan, Jawhary moved to the UK believing that she stood a better chance of succeeding in her career as a woman than in a traditional place like Jordan. Soon after having her first child, she quickly realized the absence of men from the childcare scene and that a good proportion of women in the UK still sacrificed their careers for their family. “I wrote my book because I realized that the underlying factors of sexism are the same all over the world and we are all so blind to see what these factors actually are,” Jawhary said. “Women and False Choice: The Truth about Sexism,” extends the logical conclusion of gender bias in society to the workplace, and shows how our unconscious sexist beliefs translate into a sexist behavioral reality. 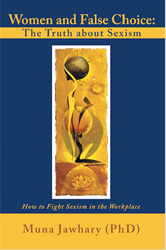 Throughout her book, though, Jawhary suggests powerful ways of creating a healthy work environment that is equally supportive for both sexes. “When the whole feminine-masculine spectrum is embraced in both sexes, the equal sharing of work and care will happen naturally – which will dissolve sexism in the process,” Jawhary said. By reading “Women and False Choice: The Truth about Sexism,” individuals will understand that sexism has a heavy cost for both men and women. She hopes that individuals will clearly see that adhering to gender identification is as crushing for men as it is for women. Dr. Muna Jawhary received her bachelor’s degree in engineering from the University of Jordan and a master of engineering from George Washington University. Later in life, she received her doctorate degree from the School of African and Oriental Studies from Cambridge. As a working mother of two and dedicated researcher, Jawhary hopes to inspire others from her writing. She currently resides in the UK with her children and enjoys blogging and coaching.